Introducing the world’s first real color changing Bloody Bathroom Mat Sheet made by IntroWizard. Scare your friends, young adults, or even yourself. Don’t be fooled by imitation bloody mats with painted footprints, this bath mat sheet is the only real product that color changes. It really turns red when wet! Water does not soak into the sheet, but instead appears to change color bleeding when in contact with your mat. The blood red color will begin to disappear in minutes and eventually fades away completely turning your mat back white again. A unique Halloween gag gift for the bathroom, hide your Bloody Bath Mat and watch the horror on their face! Unbelievably changes color, better than you’ll expect! The magic blood red color is only activated by water. Touch it with wet hands or feet! 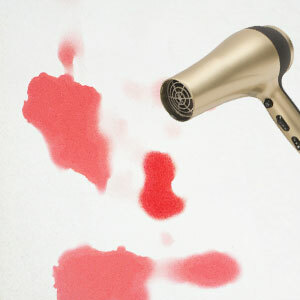 Wet hands or water drops instantly turn bright blood red. Dry your mat to return its color back to white afterwards. WATER TURNS BLOOD RED! – Try the world’s first bloody bath mat sheet prank, a thin plastic mat that reacts with water to color change your wet footprints into blood red stains. NINJA-THIN PRANK DECORATION, HIDE ME ANYWHERE – Not your typical mat, these thin color changing prank sheets are less than 1 mm thick (0.03 in) your boyfriend or girlfriend will have the shock of their life with this unique bathroom prank as they leave a trail of blood stains out of the shower. DON’T BE FOOLED BY IMITATION BLOOD MATS WITH PAINTED FOOTPRINTS – Experience the ONLY color changing blood mat sheet by IntroWizard that really turns red when wet. AWESOME HALLOWEEN DECORATION – No other horrible gag gift for your boyfriend comes close to the shock he’ll have seeing his toilet water splashes and footprint stains turn red. DRIES BACK WHITE AFTER EACH USE – getting less than two? Don’t fret. Hang to dry and watch the blood red colored stains disappear and fade back to white. Scare again and again! Get more than one and lay these nearly invisible sheets side-by-side to make an even larger surprise blood bath!